The framework’s intervention strategy has three guiding principles: 1) Act according to a positive and continuous vision of development 2) Focus on the development of personal and social competencies, and 3) Take a comprehensive approach to intervention. This requires ongoing deployment of various types of actions that shape children’s and adolescents’ school and community settings (e.g., actions that make schools a place of emotional safety and positive relationships, schools and communities that encourage responsible lifestyle choices, and so on). The intervention strategy is also aimed at deploying educational actions at the right time. A judicious mix of educational actions and actions targeting settings helps young people develop seven key competencies: self-knowledge, managing emotions and stress, seeking help for oneself and for others, adoption of prosocial behavior, making informed choices about lifestyle habits, managing social influences, and social engagement. Young people develop cognitively, socioemotionally, and physically. They must adapt to the increasing demands of school and face a range of situations that can affect their health, well-being, and academic success. 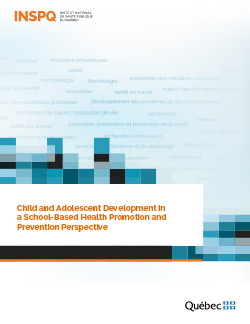 To identify what types of knowledge should be prioritized at each step of the school career, the framework takes all these development aspects into account as well as the intentions underlying the educational actions that foster the acquisition of health-related knowledge. In Secondary Cycle One, for example, educational actions must help young people both adopt daily routines that are conducive to healthy lifestyles and appreciate the effects of social influences (peers, media) on these choices. This means young people must acquire specific knowledge on the impact of lifestyle on health and academic success (particularly smoking, drugs, alcohol, and sleep).